Australian Association for Adolescent Health’s annual Youth Health Conference, “Owning Future Change”, is the premiere Australian interdisciplinary conference for young people, researchers, clinicians, health workers and educators who work to improve, promote and advocate for the health and wellbeing of young people in Australia and beyond. BYS Research and Evaluation Coordinator, Rhianon Vichta, presented at the 2018 Youth Health Conference, which explored Aboriginal and Torres Strait Islander young people’s health, diversity and health, and sexuality education and sexual health as its major themes. 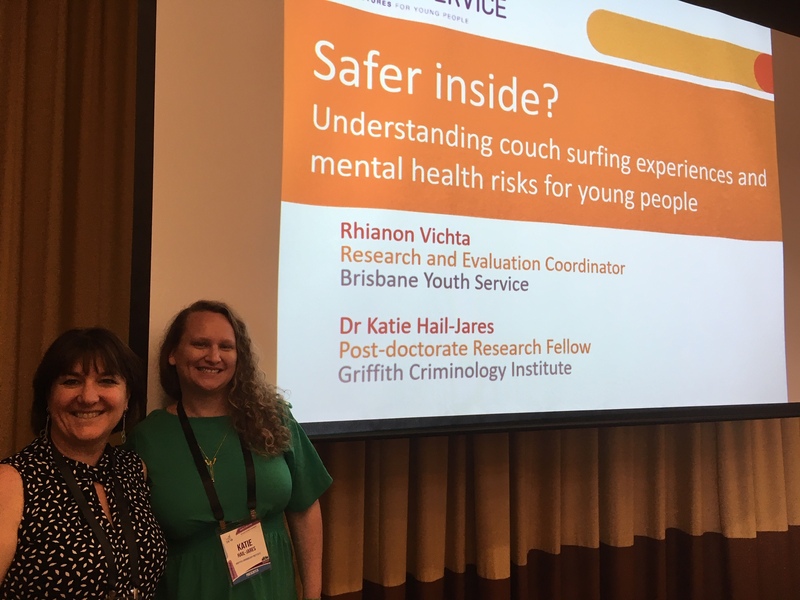 Rhianon and Dr Katie Hail-Jares, Post-doctorate Research Fellow, shared their research on couch surfing and mental health. Are streets safer than couches? Comparisons of mental health risks for young people couch surfing compared to those sleeping rough or in other forms of accommodation indicate that this may be the case. Young people who are couch-surfing, or moving transiently from house to house without a stable home or tenure, are experiencing a much less visible but increasingly prevalent and concerning form of homelessness. Since couch surfers are technically sheltered, even if temporarily, they have not historically been viewed as being as much at risk, mentally and physically, as those who are sleeping rough. Drawing upon the records of 808 young people who visited Brisbane Youth Service between 2016 and 2017, this research draws attention to important findings that young couch surfers reported significantly higher rates of self-harm, suicidal ideation and poorer mental health than any of their peers, including those who were sleeping rough. Multivariate analysis of youth service intake data shows that young people who were couch-surfing were twice as likely to report severe mental health concerns as well as very limited support networks and different substance use concerns when compared to other homeless youth. Alongside other findings related to higher numbers of young women and LGBITQ young people couch surfing, these new findings raise critical practice questions for services working with young people and indicate that experiences of couch surfing should be viewed as a potentially serious mental health risk factor requiring specific risk assessment as well as targeted early intervention and policy responses. Read more – Parity Article – Couch surfing vs sleeping rough. PreviousArt For Change - Made by young people, for young people	NextPIF Gala Dinner a success!